Barring a last-minute change of plans, Cheshire Elementary School will not reopen next school year, making Tuesday the final day of classes in a school that has been the center of a small community for nearly a century. “The word I would use is ‘community.’ Everybody is so close and takes care of each other, from the kids to the adults,” said Robin Poirot, a kindergarten teacher at Cheshire Elementary for 28 years, who attended the school herself and sent her children there. That sense of community was embraced for the final day of school on Tuesday. Students and staff wore T-shirts that read “Cheshire Elementary School, 95 years of memories.” They lined up every grade for a group photo. And they didn’t forget to honor a retiring paraprofessional, Linda Giroux, with a special ceremony. 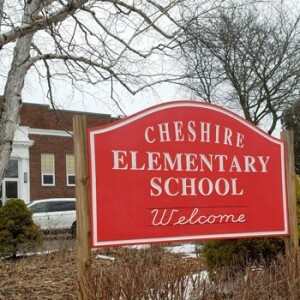 In an effort to make the district more sustainable, the school committee voted earlier this year to close Cheshire Elementary School. The district will be restructured into pre-kindergarten through third grade at C.T. Plunkett Elementary in Adams while fourth and fifth grade students move to the middle school at Hoosac Valley Middle and High School in Cheshire. Bachli will lead the newly-formatted C.T. Plunkett Elementary. The mood of Cheshire Elementary School on Tuesday was at times somber. Head Custodian Dave Richards celebrated his 30th anniversary as an employee of the school earlier this month. “It’s sad, it really is. The school is like a family here. I’ve met a lot of people here and made a lot of friends,” said Richards, who like the vast majority of the staff will continue to work in the district. Peter Bachli, who has served as the school’s principal for eight years, said the accelerated timeline of the closure has been “tough.” The School Committee received a consultant’s report on the district’s sustainability earlier this year and, within a matter of weeks, moved to close Cheshire Elementary. “I didn’t see the writing on the wall, I guess, or this happening,” Bachli said. It’s not just current students and staff who are affected by the closure of the school. “My family moved to this town years ago for the school. We have always lived down the street and Cheshire school, its traditions, teachers and close knit community is something all of my siblings and I have always been able to share,” Tarjick said.